No. 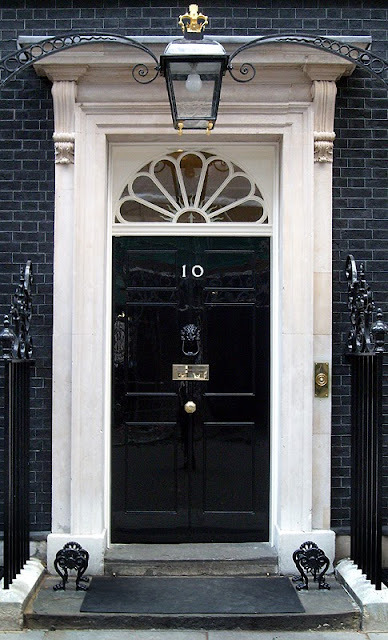 10 Downing Street is, in my opinion, a perfect ten. Classic, proportioned, balanced, symmetrical. It says, "I am beautiful and traditional inside. Please come in (knock first)." Okay, it's not that bad. 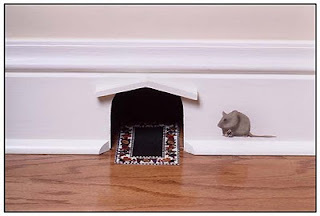 But like a mouse hole, it's not something that inspires a person to come in and sip some tea. And also like a mouse hole, it is not always obvious. People kind of have to stop and figure out where the door is, because it's hidden away on the side of the house. We knew we had curb appeal issues when we moved in, as well as other mountains of blandness to climb. Our Realtor told us, "This house doesn't have the flavor your current house has." I wasn't insulted; I took it as a challenge. Could we bring flavor to our blue coastal saltbox slash colonial with the side entry "front" door? I still believe we can, although five years later, our yard and the exterior remain largely untouched. Well, we did put on a new roof. It's a gorgeous roof, even though our house is so tall you can only see the roof from half a block away. And we planted stuff that is mostly growing. Nevertheless, our house lacks curb appeal. People mainly stop to look at our house because they plan to visit us and wonder if they've found the right address. What I'd like is a house that makes the dog walkers and joggers and baby stroller pushers pause (the way I pause for so many of the other homes in our neighborhood). I want my home to rise up and greet me, as Oprah puts it. Right now it kind of halfheartedly blows a fake little air kiss from a sitting position.